Agricultural Chemicals Reference from C.H.I.P.S. 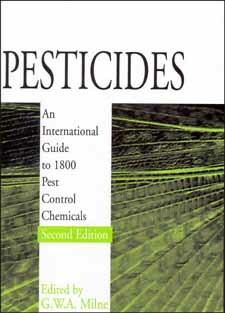 This handbook contains records for all the major chemicals currently used in pesticides. This compilation provides important chemical and toxicity data for the 1,800 substances registered by the US Environmental Protection Agency and used largely in the agricultural environment. The chemical, physical and bioactivity properties of each agent are recorded along with a comprehensive listing of product trade names and synonyms as well as manufacturers. The EPA status of each agent is given and each record carries the appropriate CAS Registry Number and the associated EINECS Number where available. The Merck Index number is also provided for all chemicals in this edition which also appear in the 13th edition of the Merck Index. A key strength of this new reference is the extensive coverage of synonyms. The book includes an index of 28,000 chemical synonyms and trade names with a cross-reference to their main entry. This extraordinarily comprehensive view of trade name and generic synonyms makes Pesticides 2nd Edition one of the world's most exhaustive references for agricultural chemical synonyms.